This is the time of year where we are all about grilling. Most nights we have some kind of grilled chicken or steak (my daughter loves steak so we are having that more often than usual). 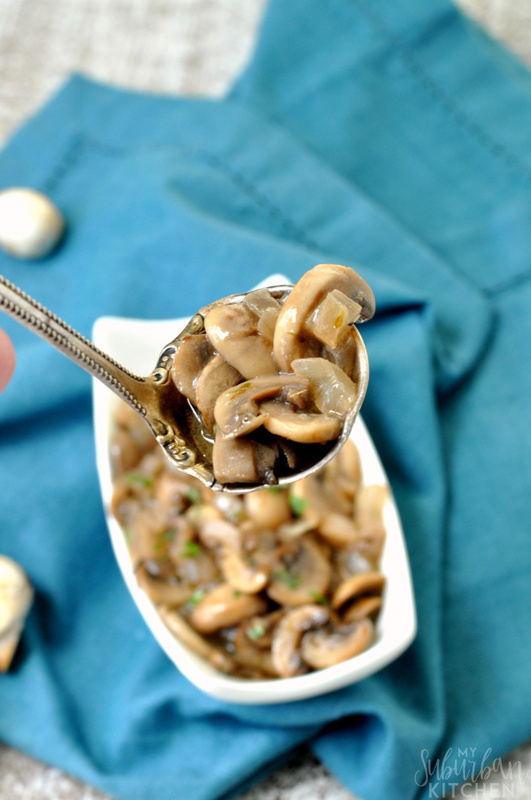 My absolute favorite thing to put on top of a steak are perfectly sauteed mushrooms. 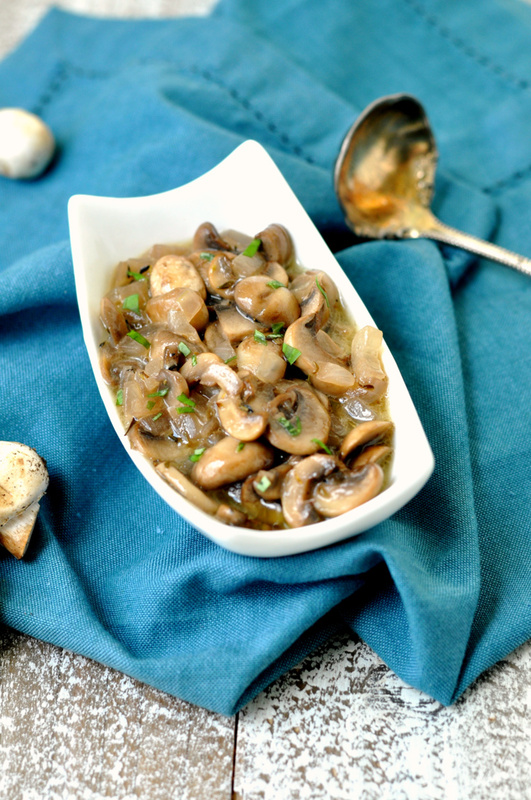 I am the only one in our house who actually eats mushrooms so I needed a recipe that I could make in a small enough batch that they wouldn’t go to waste. This recipe is perfect for 1-2 people. I just use whatever I have leftover in pasta the next day and it works great. 1. Heat oil over medium heat in a medium saucepan. Add onion and cook, stirring occasionally, for 2-3 minutes. Season with salt and pepper. Add garlic and mushrooms. Stir and, then, cook for 1-2 minutes. 2. Stir in white wine and bring to boil. Reduce heat to low and simmer until most of the liquid has been reduced. Add butter and stir until melted. Remove from heat. I usually start these sauteed mushrooms right after I put my steaks on the grill and they are done almost at the same time. You can add some fresh thyme in for a little added flavor if you want but I think they are perfect as is. In addition to steaks and pasta, I have also used these on top of burgers with some Swiss cheese. It tastes amazing together. 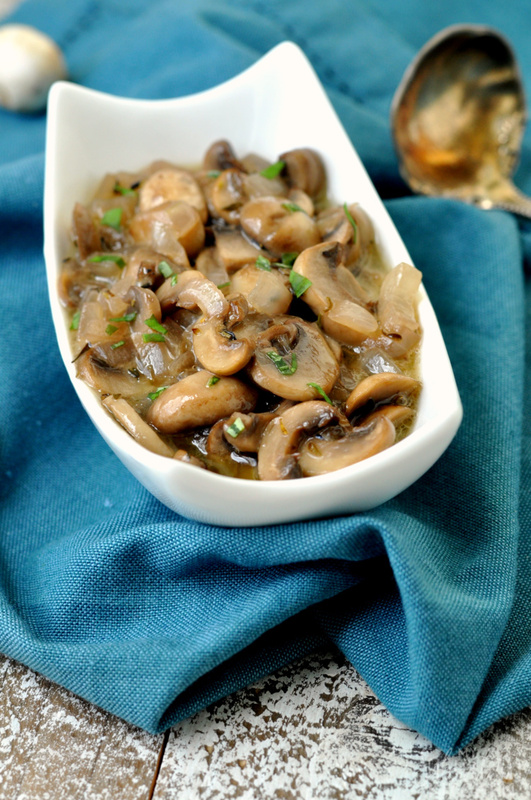 There are just so many ways you can use these sauteed mushrooms so let your imagination lead you. What are your favorite toppings for steaks and burgers? Heat oil over medium heat in a medium saucepan. Add onion and cook, stirring occasionally, for 2-3 minutes. Season with salt and pepper. Add garlic and mushrooms. Stir and, then, cook for 1-2 minutes. Stir in white wine and bring to boil. Reduce heat to low and simmer until most of the liquid has been reduced. Add butter and stir until melted. Remove from heat.